Basketball is a game full of exciting moments. Whether you see a dunk thrown down, watch the rim shake and hear the crowd erupt; or watch a 3-ball drop from long distance to beat the buzzer; or watch a strong block deny a go-ahead lay-up. But one of the most underrated elements of the game is the passing. The game is filled with slick passers who can make the highlight reel (go ahead and Google highlights of Jason Williams). There's something about a well-timed pass that can draw the eye, and if it leads to an alley-oop, all the better. The pass sets the table for the points or play to follow, so it's an understandably important part of the game. The better the passing, the better the chances of success. So it makes sense that with one of the most prolific passers in the state, Wilsonville ran up a 27-2 record over the course of the season. Who was that passer? That was senior Jack Roche. The Wildcat's prolific guard set a school single game record early in the season with 18 in the season opener against Ridgeview. In the state championship game against Churchill Roche Roche set the 5A tournament record with 13 assists. Wilsonville head coach and Jack's father, Chris Roche, correctly pointed out that Jack was "the best passer in school history." And that's not hyperbole, the records speak for themselves. 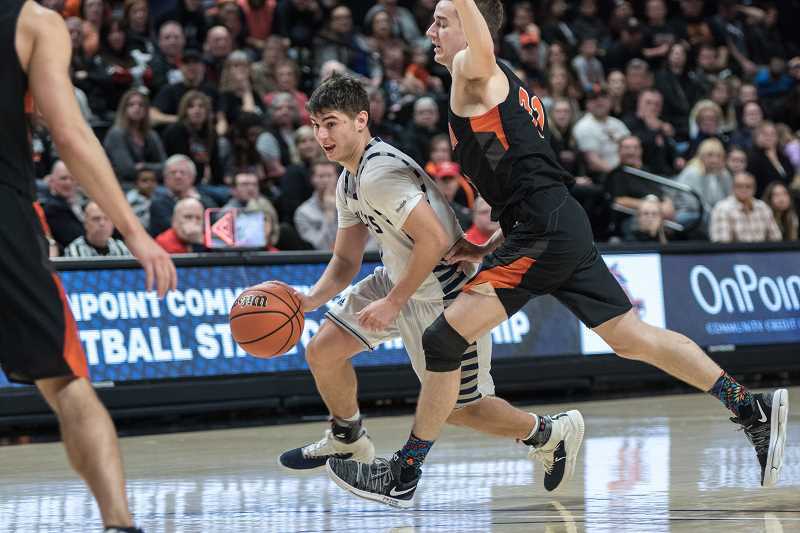 Whether finding the moving man in transition, or locating a post in the paint for a quick bucket, or even the odd alley-oop to junior Dakota Reber, Roche had an eye for the assist. The lopsided scores that Wilsonville was able to post over the course of the regular season and the first half of the postseason were in large part due to the senior's passing accuracy. Add onto that his shooting numbers from beyond the arc and on the lay-in, and it's not a wonder the team posted the scores it did. Of course, Roche always was quick to deflect the accolades. When told about the record-breaking performance against Churchill, the humble senior deflected to his teammates, praising their effort over the course of the title run. "That record belongs to my teammates," he said. "My shot was kind of off this whole tournament, but making shots doesn't win games like this. Being tough and together does, and that's what he talked about from Day 1." Roche and his slick passing have been a part of a championship caliber team since his freshman year. The senior was a part of the 2015-16 championship teams, and was part of the follow-up performance in the 2016-17 squad as well. Now with a third championship in four years, Roche and his fellow seniors leave the program in the capable hands of a new group of leaders. Juniors Reber, Shivers, Gabe Reichle and others will look to continue its championship run next year. Roche and this year's seniors have passed the title aspirations off to the next generation of athletes, and things are still looking bright.